Head and neck cancers account for about 4% of all cancers in the United States, are more than twice as common among men as they are among women, and are more often diagnosed among people over age 50. Cancers of the head and neck are further categorized by the area of the head or neck in which they begin including the oral cavity, pharynx (throat), larynx, paranasal sinuses and nasal cavity, and salivary glands. They can include hypopharyngeal cancer, laryngeal cancer, lip and oral, cavity cancer, metastatic squamous neck cancer with occult primary, nasopharyngeal cancer, oropharyngeal cancer, paranasal sinus and nasal cavity cancer, salivary gland cancer. The Alpha DaRT treatment can be applied under local anesthesia in a short single session and can be combined with chemotherapy and immunotherapy to increase effectiveness, according to Alpha Tau Medical. The company reports Alpha DaRT can even trigger anti-tumor immunity for the elimination of distant metastases, NoCamels reported. Clinical trials for Alpha DaRT will be conducted at the Sapienza University of Rome, which is initiating Alpha Tau’s clinical trial protocol for squamous cell carcinomas of the skin and oral cavity, and the IFO (Istituti Fisioterapici Ospitalieri), which is conducting its first study of Alpha DaRT for the treatment of cutaneous and mucosal malignant neoplasia (CMN). Alpha Tau is also collaborating with key cancer physicians worldwide to investigate the Alpha DaRT as a treatment for other cancers, including pancreatic, breast and prostate, NoCamels reported. Itzhak Brook, M.D., M.Sc., shares the story of his initial diagnosis and treatment for cancer of the head and neck, outlining the challenges that came along with treatment, with fellow board member of the Head and Neck Cancer Alliance Meryl Kaufman, M.Ed., CCC-SLP, BRS-S.
Meryl Kaufman, M.Ed., CCC-SLP, BRS-S: Dr. Brook, can you please share your story about your cancer diagnosis in 2006 and the treatment that followed and also the subsequent surgery that you went through? Itzhak Brook, M.D., M.Sc. : Once I learned I had cancer and my doctors removed it when they had to biopsy, I needed to receive radiation therapy. I did not get any chemotherapy, and the radiation therapy lasted six weeks, five days a week. It was very difficult to experience the radiation, and the side effects start to accumulate within a few days. And I had to deal with inflammation of the mouth, mucositis, difficulty in swallowing and pain in my throat, and I experienced a burning of the skin around the area of radiation, weakness and then difficulty maintaining intake of food. After a while, I could lose weight, and I tried to persevere because I knew that I had to receive the treatment to get better and soldier through it until it was over. Meryl Kaufman, M.Ed., CCC-SLP, BRS-S: Exactly. And some people have such severe side effects from the radiation that they actually require a feeding tube to support them during their treatment. In that case, often patients are encouraged to eat and drink and use that feeding tube to supplement what they’re able to eat and drink. Did you find that there were certain foods that were difficult for you to swallow and you needed to avoid during that time? Itzhak Brook, M.D., M.Sc. : I was fortunate that I was able to maintain my hydration and nutrition without the feeding tube. And in my trial and error, I found solid food, cold food, such as watermelon, ice cream and sour cream. I tried to consume high-calorie food so that even though I don’t eat as much, I would still take calories in and not lose a lot of weight. I was lucky I lost only 5 pounds, but some people lose more. The most important thing is to stay hydrated, get enough food and get enough water, which at that time was a real challenge, as the nausea increased over time. But fortunately, I had a very good support system in the place where I got it. I had a radiation oncologist who had advised me and told me and helped me cope with the side effects. Meryl Kaufman, M.Ed., CCC-SLP, BRS-S: Exactly. And how important was your support system at home? Who supported you and helped get you through that treatment? Itzhak Brook, M.D., M.Sc. : Obviously, that’s very, very important. My wife and children were very supportive of me, and they knew that I was going through a rough time and tried to help me in all the other ways possible. Also, at work, I got a lot of understanding and support from my team of co-workers. I was then in the military. I was in the U.S. Navy and got my treatment at Walter Reed, and they were very, very helpful in trying to ease it. Meryl Kaufman, M.Ed., CCC-SLP, BRS-S: And then when the cancer came back, you faced a laryngectomy. Can you talk to us about what that meant to you and what sort of associated fear and stigma you experienced? Itzhak Brook, M.D., M.Sc. : Well, the most important thing was that they caught the cancer, and that was because I saw an otolaryngologist every month, and this is done for the first year and second year because that’s the time when more recurrences happen, in those two years. And when the cancer was diagnosed, they tried to remove it through an endoscopy and direct biopsy, but it was already too difficult, as it had gotten into the areas where simple procedures couldn’t work. And then they realized that I needed an experienced physician to do it, and I went for a second opinion to another otolaryngologist in a different city. And he referred me to another one because he felt that person would be the best to do it. And fortunately, we have fewer laryngectomies today, partly because of the experience in doing it is less prevalent and you need to find what I found: the person who knew it best. And they finally removed it, but the understanding that I needed laryngectomy was very difficult. I suddenly realized that my voice would be lost, and I like to speak. Like anyone, I like to lecture, and accepting that I would have to lose my voice was very difficult. I remember that as a medical student some 50 years ago, when I saw laryngectomies, I said to myself, “If I ever have to make a choice, I would never give up my choice even if it cost me my life.” But once I had a choice and I also understood that I could still speak—differently, but I could speak—I made the decision very quickly. There was no doubt in my mind that in order to stay alive, I was going to do it, and I don’t regret it. Meryl Kaufman, M.Ed., CCC-SLP, BRS-S: That’s so important for people to understand that there is life after laryngectomy or glossectomy, in the case of having your tongue removed or part of your jaw. There is life, there is rehabilitation and there are ways to go about learning how to speak and swallow again in the face of these challenges. What is something that you wish you had known prior to the diagnosis or during that time period that you can give to other people facing the same situation? Itzhak Brook, M.D., M.Sc. : I wish I had known that I needed to go to the best physicians who are experienced in the field to do the procedure, and I should not have avoided to make the decision right away but take the time to search for the best person who could help me. I also wish that I had known that even though I was prepared for the procedure, my physicians, nurses and speech pathologists did prepare me, helped me, and they explained to me that experiencing this is completely different from all the words and explanations. And it’s still a very difficult period to undergo this major surgery and be in the hospital completely helpless. But it was worth it because even though it was difficult, I got my life back, and I still believe that life is a very, very precious thing. And if you need to lose something to gain life, it’s worth it. The United States is in the midst of a head-and-neck cancer epidemic. Although survival rates are relatively high—after treatment with chemotherapy and radiation—survivors can suffer permanent loss of salivary function, potentially leading to decades of health problems and difficulties eating. It is unknown why the salivary gland sometimes cannot heal after radiation damage, but Wen Yu “Amy” Wong, BS, a University of Arizona cancer biology graduate student, may have taken a step toward solving that riddle. Radiation often comes with long-term or even permanent side effects. With a head-and-neck tumor in radiation’s crosshairs, the salivary gland might suffer collateral damage. The quest to restore salivary function in post-radiation head-and-neck cancer patients starts with learning why the salivary gland is unable to heal itself after radiation damage. Just as a maintenance crew can repair downed telephone poles after a storm, the body is able to heal itself after injury. Unfortunately, in post-radiation dry mouth, salivary glands’ ability to regenerate might be blocked. In the lab, Wong was able to artificially force the regeneration of salivary glands, allowing her to learn where there are obstructions in the regeneration process. Wong particularly was interested in something called the ROCK pathway, which might go awry in the wake of radiation, blocking E-cadherin and β-catenin from reuniting. “If I use an inhibitor to prevent this ROCK signaling pathway, these two proteins come back together,” Wong said. The next step is to learn more about how a defective ROCK pathway blocks salivary glands’ natural ability to regenerate following radiation damage. Unlocking this secret could uncover novel ways to treat or cure post-radiation dry mouth. Earlier this month, Wong and her co-authors were recognized by the American Physiological Society for their investigation, which was published in June by the American Journal of Physiology—Regulatory, Integrative and Comparative Physiology. Wong, along with Maricela Pier, BS, a research specialist with the UA College of Medicine—Tucson Department of Cellular and Molecular Medicine, and Kirsten Limesand, Ph.D., of the UA Cancer Center and professor of nutritional sciences with the UA College of Agriculture and Life Sciences, was selected for the APSselect award, given to the best articles in physiological research. Dr. Limesand takes her role as a mentor seriously, and finds it deeply satisfying. Dr. Limesand is a professor with the UA Cancer Biology Graduate Interdisciplinary Program, which emphasizes translational research to address significant problems relating to cancer development and treatment. Students are prepared for careers in cancer research through an interdisciplinary approach involving faculty members from a wide range of disciplines. Beating cancer is a race against time. Developing radiation therapy plans — individualized maps that help doctors determine where to blast tumours — can take days. Now, Aaron Babier (MIE PhD candidate) has developed automation software that aims to cut the time down to mere hours. He, along with co-authors Justin Boutilier (MIE PhD 1T8), supervisor Professor Timothy Chan (MIE) and Professor Andrea McNiven (Faculty of Medicine) are looking at radiation therapy design as an intricate — but solvable — optimization problem. 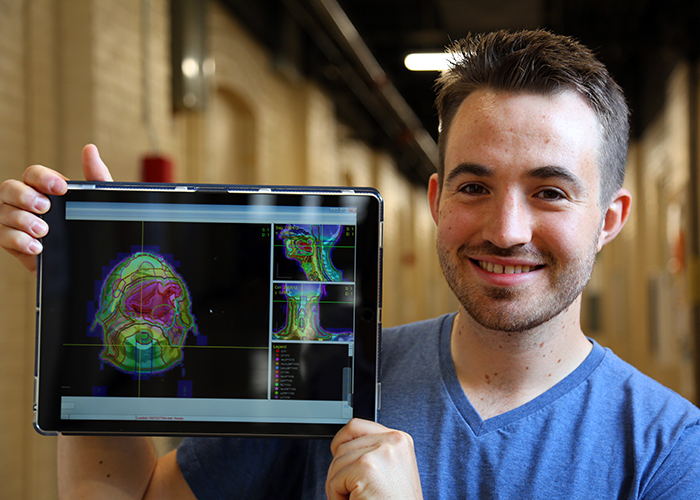 Their software uses artificial intelligence (AI) to mine historical radiation therapy data. This information is then applied to an optimization engine to develop treatment plans. The researchers applied this software tool in their study of 217 patients with throat cancer, who also received treatments developed using conventional methods. The therapies generated by Babier’s AI achieved comparable results to patients’ conventionally planned treatments. — and it did so within 20 minutes. The researchers recently published their findings in Medical Physics. “There have been other AI optimization engines that have been developed. The idea behind ours is that it more closely mimics the current clinical best practice,” says Babier. If AI can relieve clinicians of the optimization challenge of developing treatments, more resources are available to improve patient care and outcomes in other ways. Health-care professionals can divert their energy to increasing patient comfort and easing distress. “Right now treatment planners have this big time sink. If we can intelligently burn this time sink, they’ll be able to focus on other aspects of treatment. The idea of having automation and streamlining jobs will help make health-care costs more efficient. I think it’ll really help to ensure high-quality care,” says Babier. Babier and his team believe that with further development and validation, health-care professionals can someday use the tool in the clinic. They maintain, however, that while the AI may give treatment planners a brilliant head start in helping patients, it doesn’t make the trained human mind obsolete. Once the software has created a treatment plan, it would still be reviewed and further customized by a radiation physicist, which could take up to a few hours. Trained doctors, and often specialists, are still necessary to fine-tune treatments at a more granular level and to perform quality checks. These roles still lie firmly outside the domain of machines. For Babier, his research on cancer treatment isn’t just an optimization challenge. “When I was 12 years old, my stepmom passed away from a brain tumour,” Babier shares. “I think it’s something that’s always been at the back of my head. I know what I want to do, and that’s to improve cancer treatment. I have a family connection to it. It adds a human element to the research,” says Babier.